I was flipping through the channels when I saw it. I gasped and started laughing. You see, I remembered that back in the late 1990s and early 200s, Tinky Winky, Dipsy, La La and Po burst onto the scene and captured the hearts of America’s children. They also captured the ire of pop culture enthusiasts, political commentators, and parents. The Teletubbies ARE weird after all. Jerry Falwelll ignited a firestorm when he called the purse-carrying Tinky Winky gay and seemed to insinuate that if you let your kids watch Teletubbies, they might become gay, too. Remember, Millennial moms and dads, this was before social media and smart phones. All we had was cable TV and the internet. Heck, I don’t think anyone was even blogging yet. My son, born in 2003, was an active baby. I still remember the day I matched all his traits to the description of “active” baby in the What to Expect book. It meant he slept very little, but might turn out to be bright from all the stimulation he sought. I clung to that future promise as I stumbled my sleep-deprived self through each day. But, then, one day when he was toddler, he stopped his incessant movement and stared at the Teletubbies on TV. Something about those nonsensical lumps of red, green, yellow and purple captivated him. When my son watched Teletubbies, I got 15 minutes of freedom. 15 whole, lovely, God-given minutes. It was a blessing. A gift. I could sit down. I could clean up. I could go to the bathroom. My husband worried that the Teletubbies were psychedelic, and that letting our toddler watch them was equivalent to giving him drugs. Or the fact that the show was just plain weird and we would raise a weird kid. Maybe, Millennial Moms and Dads, you have these thoughts, too. But the Teletubbies did not ruin our son. Rather, they saved me in those dark, monotonous, exhausting moments of motherhood when you just need a break. The Teletubbies gave me 15 minutes. They gave me a break. I’m right there with ya! My daughter watched Teletubbies back in t he day. I think the show has no rhyme or reason, but it obviously captivates little ones. I know, right? Some sort of weird blobs of moving color just sucked them in! OK, I will admit it, there is one kids program my kids MAY NOT WATCH.. And that’s the Teletubbies. Nope, Never, No way! While i personally cannot stank the teletubbies, whatever show you are able to handle in order to give you a precious moment to do ANYTHING is absolutely worth it. Anyone who gives you crap for letting your kid watch a bit of TV to give a mom a bit of sanity is just plain mean. I caught one episode when Tommy was small and was like, “Nope.” I couldn’t. I wish I could be Nope. It’s funny to think how much it drove my husband bananas. Such small potatoes, really! My son hated the Teletubbies, the vacuum thing terrified him and luckily no one else around here has gone down that dark road. Although one more episode of Little Einsteins and I just might….. I haven’t seen Little Einsteins in years but I tell you that theme song pops into my head at least once a month. Sigh. We were never Teletubbies watchers. But I’m really getting sick of Mickey Mouse Clubhouse. Maybe it’s because I’m 6 years in. Thanks so much for joining us at the #hapynowlinkup! My children are just 4 and wouldn’t know about the Teletubbies if not for their sneaky aunt who was determined to introduce them by way of old books and puzzles. My husband continues to conduct regular Tubby search and destroy missions but the books seem to multiply! Oh my gosh thank you for reminding me about Noo Noo!! Now I’m smiling. Whatever works, Kelly. EXACTLY. Do you remember them saying Big Hug? Big hug to you today! 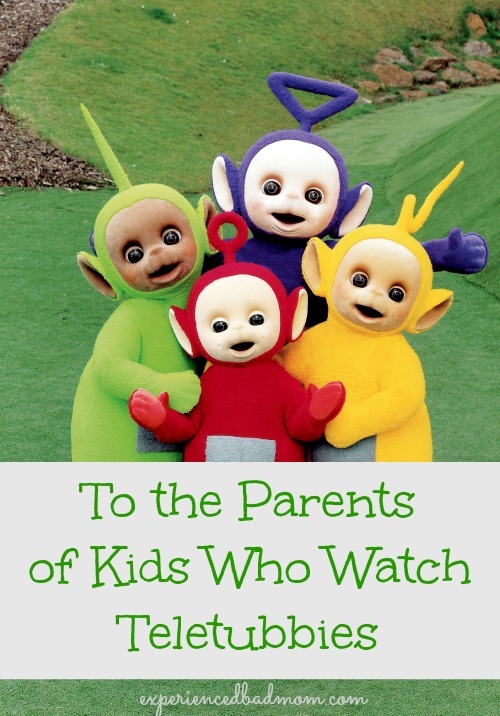 My first exposure to Teletubbies was babysitting for a little girl who loved the show. The first time she turned on the TV and Teletubbies was on, I was pretty freaked out. They are truly psychedelic! I’m still freaked out. My daughter loved those bizarre creatures, I bought her all the toys associated, even after one was dubbed gay. Because like yourself, it bought me alone bathroom time & the luxury of brushing my teeth and combing my hair. For the record, my daughter made it through childhood & isn’t dropping acid at Coachella. So I think we’re the real winners here.